Barbara Kruger is a fascinating and profoundly influential artist. 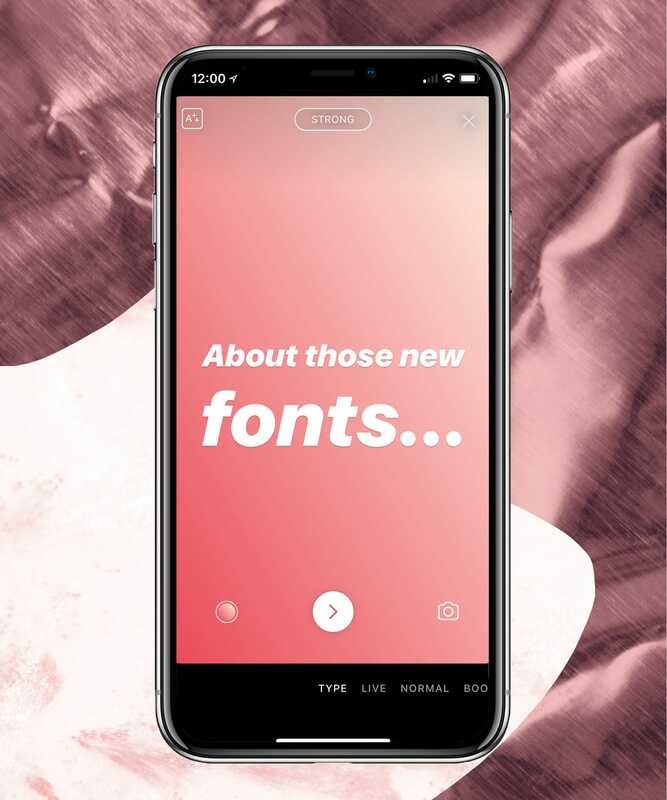 She works in big, bold text usually in white font over ribbons of red. The text is usually superimposed over black and white photos, usually of people. The messages say stuff like "YOUR BODY IS A BATTLEGROUND," "WE DON'T NEED ANOTHER HERO," or "DON'T BE A JERK." If this doesn't ring a bell yet, you can find thousands of samples of her work on the internet. Maybe the fonts and colors remind of you something: the Supreme logo? That Instagram filter? It all started with Barbara Kruger. She does a lot of installation work these days, which is a fancy way of saying that her work just consumes entire rooms - huge rooms with huge strange writing taking up every inch of floor, ceiling, and walls. Her messages are pretty clear: it's about politics, media, and culture, and the way it's presented provokes people to question themselves. Her work is on display in Los Angeles at the Broad Contemporary Art Museum, and in contemporary museums across the world. Click here to listen to Barbara Kruger's interview on YouTube. Randy Newman is a legend: Countless scores. Dozens of albums. Academy Awards, Grammys, Emmys. A songwriting career that's spanned decades. He's written some of the best tunes to come out of the 20th century. Hear his name and you'll start thinking about hits like "You've Got a Friend in Me," "Short People," and "I Love L.A." But look a little deeper into his body of work - it won't take much - and you'll find a songwriter and singer who's produced some of the most complex, captivating, pop music ever recorded. You probably know this already, but just about every week we bring you a recommendation at the end called The Outshot. We can't think of a musician Jesse's written more Outshots on than Randy Newman. Randy's songs are catchy. That's part of it. He grew up around the birth of rock and roll to a musical family. His uncle, Alfred Newman, composed music for some of the greatest films out of Hollywood's Golden Age. And he's funny, but not like Weird Al or Spike Jones funny. There are laughs, but it's always behind a dark, kind of cynical side undertone; and he's got a genuine sense of comic timing and wit. His best work marries a love of modern pop and soul music, an intimate knowledge of classical music and The Great American Songbook, and comedy, which he says he got from his Dad - an internist with a biting sense of humor. Randy's carried that tradition on for his latest album - last year's "Dark Matter." It's available to stream and buy now. Also, if you live in LA you can see him live at the Hollywood Bowl on Sunday, August 12 alongside a full orchestra. If you're up in Northern California, you can see him at the Luther Burbank Center in Santa Rosa on August 4. In this conversation, Randy explains why, over the years, he's struggled to like one of his most critically acclaimed songs. He talks about how he's changed his approach to songwriting over the years. What's easier now? What's harder? And lastly, what's the deal with "I Love L.A."? Is it sincere? Ironic? Hard to tell with a guy like Randy. 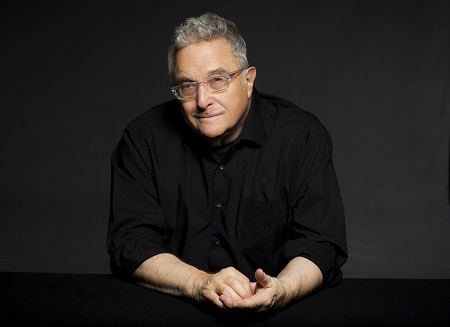 Click here to listen to Randy Newman's interview on YouTube. 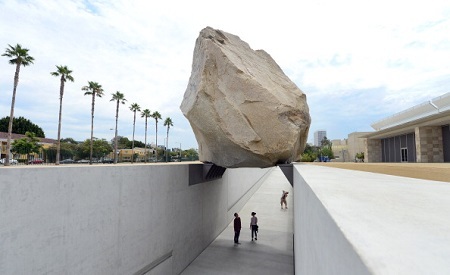 In this week's Outshot, Jesse talks about a powerful and amazing big ol' rock that is Levitated Mass, a sculpture at the Los Angeles County Museum of Art by the artist Michael Heizer.